How does tangible change take hold of a community and make a profound impact? It doesn’t happen overnight or even over a handful of years, yet it only takes one small pebble to make a ripple that eventually expands beyond the horizon. For many of us, we were brought up to have a vision for our future, to set goals, and to implement plans on how to achieve them. It is a privilege that we often take for granted. This isn’t the case, however, for many Native American children. Derrick discusses what first compelled him to get involved with the SWO Youth Department and help Native youth realize their potential. "I grew up in Lower Brule, Ft. Thompson area. I had a good childhood. I took in nature, was always outside, and I was always involved in sports. Our family looked after each other.” He states fondly, “We just had a bunch of old grandpas and grandmas looking out for us. I didn't grow up with a lot of the struggles. My parents weren't alcoholics. They pushed us in sports. I was pretty fortunate to have both parents in my life." He recounts that it wasn’t until the passing of his mom when he was thirteen that his world changed, and his eyes were opened to the reality of pain and loss. Derrick explains, “I'll put it this way: I became so used to the pain, that that's all I expected...to get hurt. To be in pain." He attributes his ability to stand up and stand out to the fact that he has always been different. He explains, “I’m the black sheep of my family. I'm the black sheep of my friends. I'm the black sheep of my community. I always tried to fit in, but I just couldn't. And when I finally realized that I wasn't supposed to 'fit' in, that's when I made a choice to make a difference," he says of his aspirations to be the voice of change. "There's something about being addicted to helping that just never goes away." He, however, has a very clear vision for what he hopes that he and the SWO Youth Department can accomplish in the lives of the kids. "Our hope is to get back to our traditional morals. Our traditional thought process. That we have to be there for each other. That family's important. Of helping our neighbors. Our friends. Not tearing each other down. Like the ‘old school’ ways and thinking. We have to be contemporary with our lives, but our mental process can be different." He recalls recently talking with a couple kids who were dealing with suicidal thoughts. "They may look at me and say, ‘Hey, Derrick’s got it together. He graduated college. He has a family…' but I sit down with them and say, ‘Hey, these are some of the struggles I went through.’ It's easier to talk to the older kids that way, but with the younger kids it's all about creating connections and trust. They just want you to play with them." As the Youth Department continues to hold more events, Derrick is excited to report that "the drug and drinking-related charges are down." Organized events encompass activities like Wii bowling championships, Super Bowl parties, movie nights, healthy cooking classes, Sioux Falls Skyforce games, youth basketball camps, bowling nights, as well as meetings with speakers who discuss the real issues of bullying, drugs, and alcohol abuse. 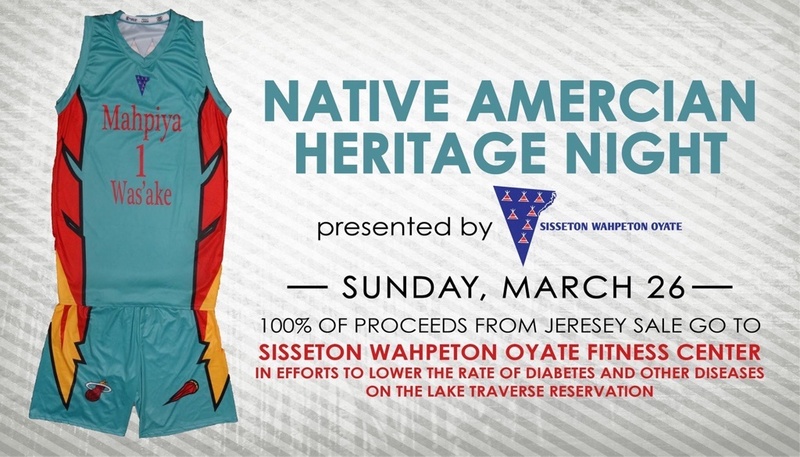 One of their highlights this past year was designing the basketball jerseys for the Sioux Falls Skyforce NBA B league team, which were worn on Native American night in March. They are also excited to be collaborating with the Minnesota Twins baseball team in the upcoming year. “We’re creating a vision,” Derrick states. “We are seeing the kids and their families taking part together. We’re seeing family togetherness.” He is also observing kids who are no longer scared to engage and open up. “We’re getting kids to come out of their shell and be more responsive. I think everybody is so used to being let down. It's a slow process. But any small step is progress." The SWO Youth Department has a meeting every month where Derrick encourages the staff, telling them this message: “While you're here, I need you to be somebody that you needed when you were a kid. I say that's your number one goal. All these kids want is for you to be in their life, so be somebody that they need at this moment. If they need an ear, then lend your ear. If they need you to talk, then talk. If they need you to go for a walk with them, then go for a walk with them." All of us at Native Hope are passionate about programs like these, empowering Native American youth to have hope and a vision for the future.